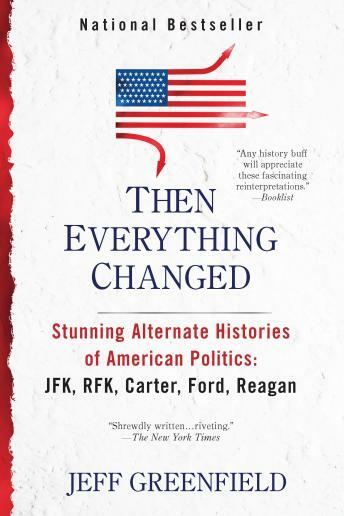 A brilliant and brilliantly entertaining tour de force of American politics from one of journalism's most acclaimed commentators.History turns on a dime. A missed meeting, a different choice of words, and the outcome changes dramatically. Nowhere is this truer than in the field where Jeff Greenfield has spent most of his working life, American politics, and in three dramatic narratives based on memoirs, histories, oral histories, fresh reporting with journalists and key participants, and Greenfield's own knowledge of the principal players, he shows just how extraordinary those changes would have been.These things are true: In December 1960, a suicide bomber paused fatefully when he saw the young president-elect's wife and daughter come to the door to wave goodbye...In June 1968, RFK declared victory in California, and then instead of talking to people in another ballroom, as intended, was hustled off through the kitchen...In October 1976, President Gerald Ford made a critical gaffe in a debate against Jimmy Carter, turning the tide in an election that had been rapidly narrowing.But what if it had gone the other way? The scenarios that Greenfield depicts are startlingly realistic, rich in detail, shocking in their projections, but always deeply, remarkably plausible. You will never think about recent American history in the same way again.